When your customers purchase or transfer a domain name, they will need to select the nameservers their domain names will point to. In your Reseller Control Center, you can designate your own custom hosting and parked nameservers as the default settings. Note: You do not need to complete the steps below if you prefer to use our hosting nameservers by default, rather than assigning custom nameservers. Log in to your Reseller Control Center. 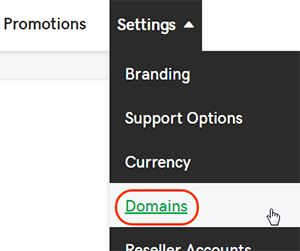 Go to the Settings tab and select Domains from the dropdown. Note: To use this feature, your hosting products and top-level domains (TLDs) must support custom nameservers. See the More info section below for details on setting product offerings. After selecting an option, enter the specific custom nameservers you would like to be used. Select which nameservers should be assigned by default. Hosting — Automatically assigns your customer's domain names to the custom hosting nameservers you specified in step 4. Parked — Automatically assign your customer's domain names to the custom parked nameservers you specified in step 4. Note: If you use your own nameservers to host or park your customers' domain names, you are responsible for any zone file modifications. Click Save to complete the changes. You can update product offerings and domain name offerings to support custom nameservers on your customers' domains. When ready, customize your storefront.